Having traveled well over a 1000 km (600 miles) to get to the Kgalagadi Transfrontier Park this would be our first full day actually in the Kgalagadi Transfrontier Park proper. As we’d been woken early by the roars of the famous Kalahari black-maned lions close to the outside of our tent, we were up and had breakfast and packed ready for a mornings photography/game viewing and ready to depart by the 7-30am stipulated gate exit time at this time of the year (winter). It was cold, very cold about 5 deg C but clear and as the sun was rising we could see it was going to be a great day. After collecting our ‘exit permit’ which is a golden rule in the Kgalagadi Transfrontier Park (They will ask you where you are going and in case you do not return by the time the gate closes, which is metaphoric as there are ‘no gates or fences’ at the ‘Kalahari Tented Camp’ they will come to search for you) we thought we would head for the ‘Dalkeith Waterhole’ which we briefly discovered the day before on our journey in. We also thought we would drive at a slow pace to Dalkeith as it was only about 21 km away this would give us time to game view on the way as may birds and mammals were to be seen. We set off on the sandy dry riverbed road of the Auob river towards Dalkeith Waterhole which is identified as one of the better waterholes of the Kgalagadi Transfrontier Park. 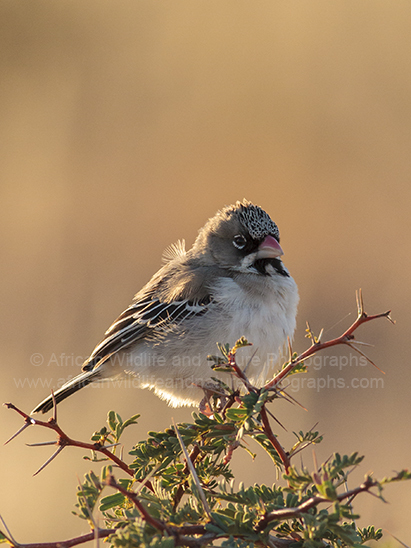 Travelling at about 20 km hr we started to see many of the bird species we had missed the previous day, Scaly-feathered Finches (Sporopipes squamifrons) lined our way perched on the shrub, hoping along the ground in and out the shrub were Kalahari Scrub-Robin (Erythropygia paena). 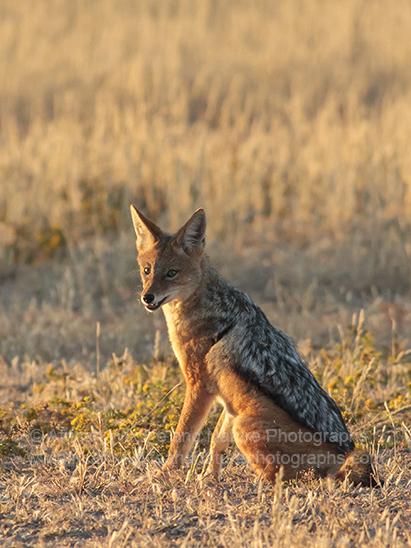 Sat in the dry Auob river bed itself bathed in our early morning light was a Black-backed Jackal (Canis mesomelas) many Springbok (Antidorcas marsupialis), Blue Wildebeest (Connochaetes taurinus) and Gemsbok (Oryx gazella) were dotted about on the dune banks. us 2 hrs to arrive at ‘Dalkieth Waterhole’. 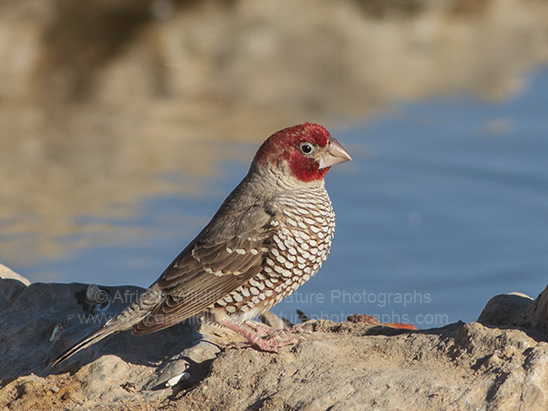 A couple of cars had already parked up as we took our position ready for any action that may happen, immediately ‘mixed flocks’ of small birds perched in nearby bushes which included Red-headed Finches (Amadina erythrocephala) and Yellow Canaries (Serinus flaviventris) rushed to the waterhole to drink only staying for a few seconds to drink, before flying back to the relative safety of the bushes. This is due to the ever present ‘birds of prey’ like the Lanner Falcon (Falco biarmicus) who also frequent these waterholes but for very different reasons. 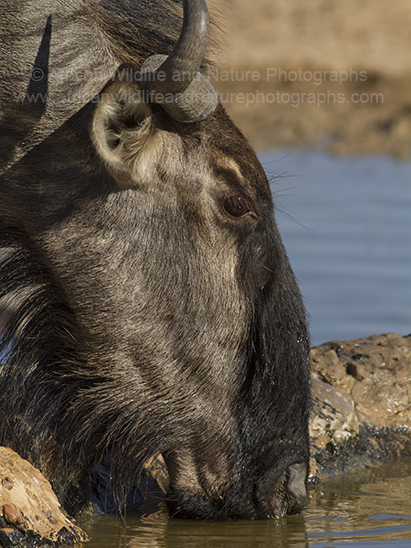 During the ‘winter months’ especially in the Kgalagadi Transfrontier Park, all animals and birds at sometime or another come to the man made waterholes to drink, today was no exception although while at the waterhole we didn’t see any of our preferred mammals drinking,like the lion, leopard, cheetah or brown hyena but we did see herds of Gemsbok and Wildebeest come and quench their thirst in this beautiful desert park. We headed back to camp for some lunch and a snooze (hard work this wildlife photography lark) before setting off to the main camp some 3km away called Mata Mata. There are only 3 main camps in the Kgalagadi Transfrontier Park where you can get ‘power’ and Mata Mata was one of them. We needed to recharge our camera and laptop batteries. We visited the camp shop to see what we could find and came away with the obligatory mug saying ‘Kgalagadi Transfrontier Park’ on the side. We headed for another small waterhole close to camp ‘Sitzas’ where we had seen the Secretarybirds (Sagittarius serpentarius) on our way to the camp the day before. We sat there enjoying the late afternoon sun with only a lone springbok to keep us company for the time we were there. Heading back to camp as the sun was setting to enjoy another ‘sundowner’ (drinks as the sun goes down) on our deck pondering our day and thinking about the ‘Milky Way’ I hoped I would see that night.